Last night I was at Planet Fitness around 7:30pm. It was jam packed with people all (probably) trying to work off their holiday pounds. It got me thinking about fitness options near Cheverly. Not that I’m an expert in this regard, to be honest, I just started to work out again 1 month ago after taking a 4 ½ year hiatus . (my oldest is 4 1/2 J) I did, however, spend an entire year paying for a gym membership that I didn’t use. Typical. As far as I know—and feel free to correct me if I’m mistaken—there are 4 great options that are close to Cheverly. I’m a member at Planet Fitness. It is open 24 hours and costs $10 a month. My husband isn’t a huge fan because he prefers heavier weights—but I contest that for $10 a month, you can’t beat it. You can find more information about Planet Fitness here. Next we have the PG County Sports and Learning Complex Fitness Center. If you have never visited this facility before, it’s a must see. They have indoor pools, a gym area, a running track—so much to do and see, especially in the winter when it is cold outside. My husband is a member here and you pay month to month so you are not under any contract. Rates are around $40 a month, but you can find more information here. Both Planet Fitness, PG County Sports and learning complex are about a 5-10 min drive from Cheverly. They are both a hands throw away from Fex Ex Field. I’m really excited about the third option as it just opened a month ago. It’s 24 Hour Fitness and I’m sure we have all seen it on the way to Wegmans/Costco at Woodmoore Town Center. If I had more time to work out and relax and pamper myself, this is where I’d go. 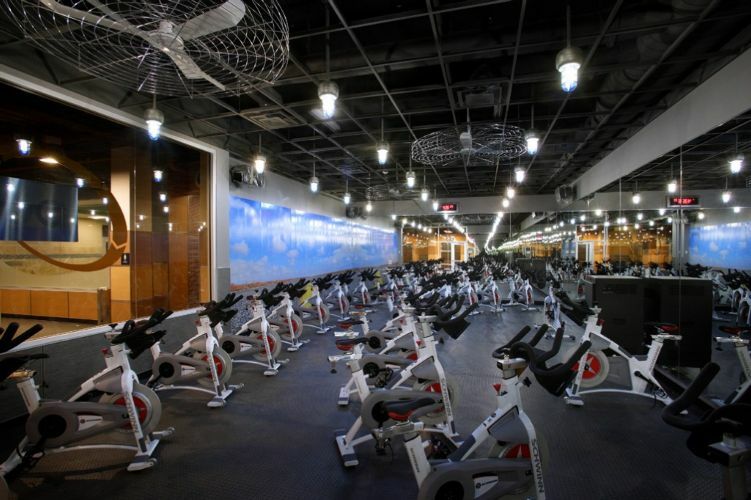 They boast of Cardio Equipment, Free Weights, Full Sized Basketball Court ,Group Cycling, Group Exercise, Indoor Lap Pool, Kids’ Club, Personal Training, Personal Training Area, Pro Shop, Sauna, Steam Room, Strength Machines, TRX Suspension Training, Towel Service, and a Whirlpool. Has anyone been there yet? I’m really curious about it. The last place I want to mention is probably a 15 min drive away- I would guess it is about 5 minutes away from Wegmans. It’s Golds Gym found at the Capital Centre. The reason I bring it up is that it has a Cardio Cinema. I’d never heard of this before but apparently you can watch a movie while working out. Maybe this would help me go longer than 30 minutes on the elliptical?! Either way, how fun. I’d love to try it out once. I have no idea of the prices for either Gold’s or 24 Hour Fitness but I’m sure they are easy to find. I also hope this post helps motivate us to think about our health this year. Enjoy! I love the Bikram yoga studio in Riverdale (10 – 15 minute drive). Fantastic hot yoga studio that also offers some express classes that only last 1 hour. Any running moms out there? Stroller strides? Or other moms in the area who would be interested in getting together at the playground and doing workouts while kids play nearby? I cannot believe I forgot about Wildflower Yoga right in our own neighborhood. Thanks! And Wildflower Yoga has a Mommy & Me class and classes for young children, too!